Hello there ladies and gentlemen! I was wondering if you could point me to some of your favorite charm pack friendly patterns. I have recently acquired several hundred 5in squares and I'm looking for some fun ways to use them. Thanks for your help! I've only made one quilt from charm packs - a D9P. It was really easy but I got bored with it pretty fast. I usually like to make sampler quilts. 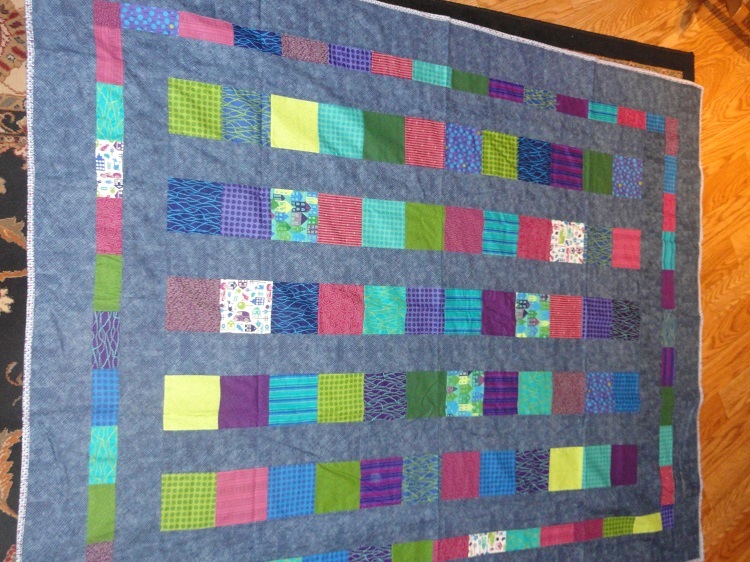 This is what I'm working on right now - http://www.modabakeshop.com/2010/10/...ars-quilt.html. So easy and cute! I'm making mine larger to fit a queen bed, so it will be about 6 charm packs. The Moda Bakeshop website has lots of great ways to use pre-cuts. Check out Missouri Star Quilt Co tutorials on YouTube. Jenny uses many charm packs in her work. I was just trying to find this pattern this morning!!! Thanks so much! Saw the quilt done and love it. Thanks for posting this one!! I have been on Moda's site before but haven't seen this one and I love it! I've made it larger just by adding more vertical strips and making them longer. Here's one I did for a high school senior. It's about 60X70. I was all ready to start the falling charms until I saw the windowpane 9 patch.....oh my! Look for the book Nickel Quilts & Borders by Pat Speth. Lots of good ideas there. Lots of good ideas posted here. I, too, have a stack of 5" squares that were given to me. I've done a couple of coin quilts using Moda Bake Shop. They are easy and come out nice. The two I've done were crib size but you could certainly make them larger. I haven't seen the windowpane one before but I may try that next. Roslynd. thank you for starting this thread. a lot of good ideas here for my stacked up charm squares. hadn't really decided what to do with them. now i can get busy. I was thinink Missouri Star Quilt Co would be a good place to start also. Check out Gourmet Quilter on youtube, she loves 5" squares.